Table Florals and which style to choose for your wedding day. 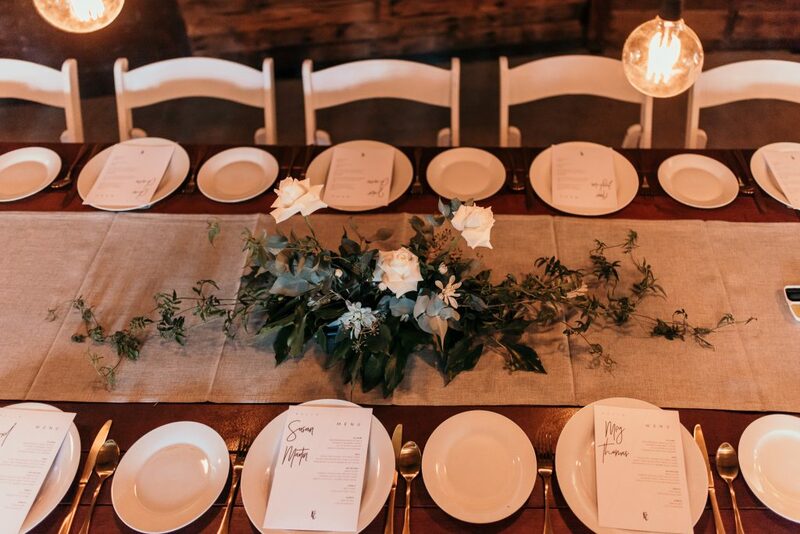 Table florals and what style to choose. 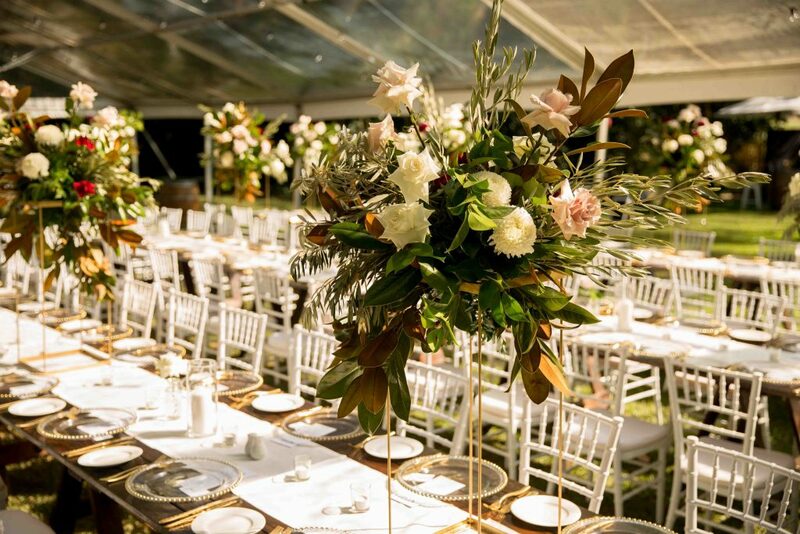 When a client first makes contact with me to design their wedding florals, they usually have an idea or style in mind for the overall floral vibe of the wedding. 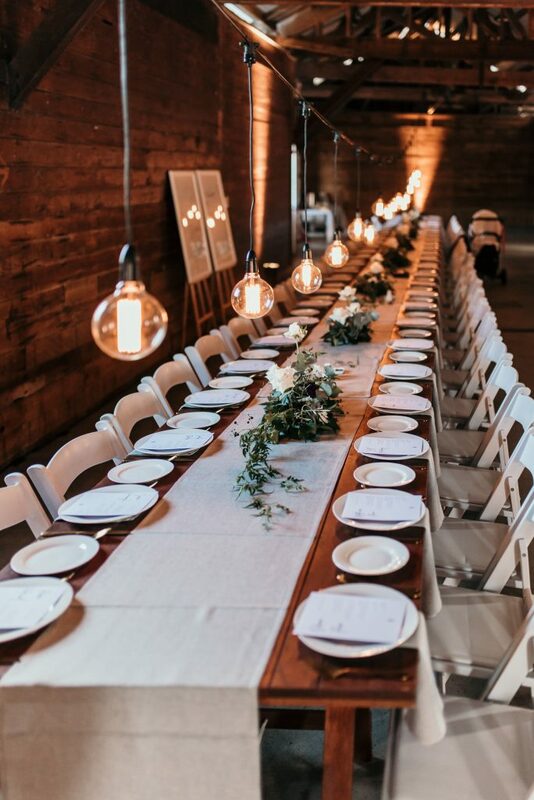 In regard to the reception side of things, my clients and I work together to create a stunning look that best suits the venue and the overall aesthetic. In the beginning stages when I am asked to provide details for table florals I always start with the same question. Because what food service you are choosing directly affects what florals are going to be most suitable for you. Over recent seasons, feasting tables or banquet style has become increasingly sought after. I personally love this style of food service. This service always works so well on those redics long guests’ tables. Love the look and feel of this. You and your friends and family chatting + laughing over glasses of wine with food laid out on your table to graze. So, when the talk of florals begins, this is where careful consideration is required. I’ve had clients who have requested a long garland of green foliage’s which looks super epic, but upon finding out their food service we’ve had to change tack. You see, platters and long foliage garlands aren’t a good fit, it is a terrible waste of funds to be covering over your garland with platters of food. What’s will happen is that the garland gets squished and that hurts my heart. Moreover, from a visual perspective, how on earth do you lay a food platter on bunches of foliage…hmm. Enter the amazingness of Floral Bursts for your table florals!! Ok, I totally gave them a name, and they are really just singular floral arrangements, BUT I’m in deep with these little bursts. They are a little bit perfect. They mingle oh-so well with each other. The food and florals make an amazing combo-garland. 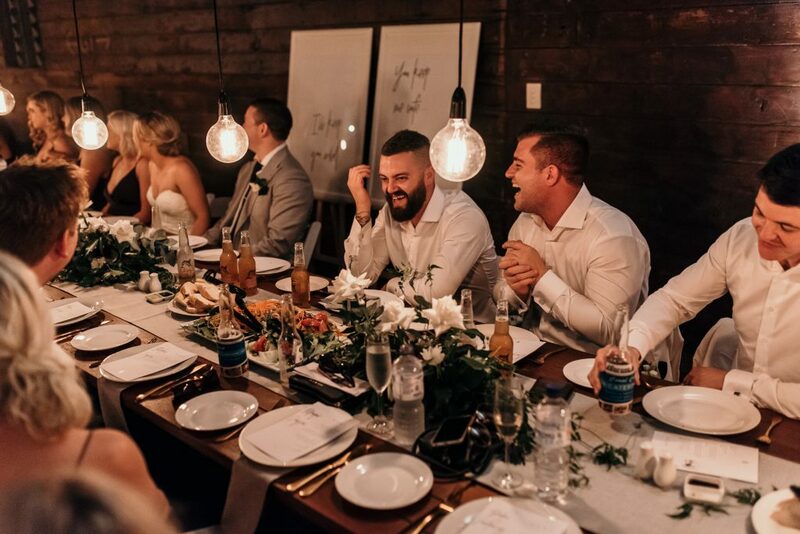 If you are sweet on these images from The Sugar Wharf in Port Douglas taken by the gorgeous Lucie Weddings then over here for more of this stunning wedding. What table florals I absolutely love using now? The taller metal stands with florals bursting from the top + underneath. They are a little bit amazing. These are just high enough so you can still see guests across from you, but not so high that they become redundant. They can be a full blown foliage fest or filled with rich seasonal blooms. 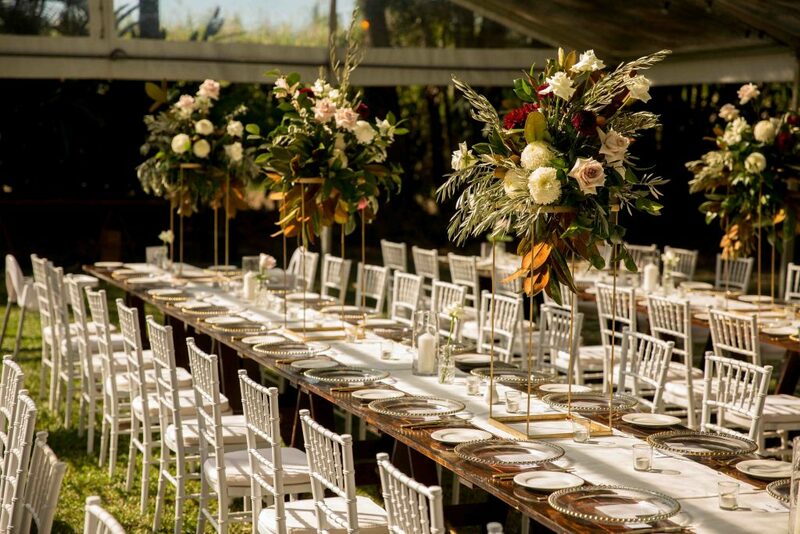 Images Port Douglas Weddings + Events. This taller style also works well with a platter food service as there is room available on your tables, and of course also for a plated meal service. What’s so great about these stands also is that if you don’t have adequate rigging at your venue for overhead hanging installs (because who doesn’t love those right?) These can be used as your pseudo overhead install. Hmm, what seeds have I just planted?! I hear your mind ticking over now. Hehe. I haven’t written anything about round tables here, because honestly, I haven’t worked with rounded tables for a few seasons…but if the trend rolls around again, I’ll be back with more intel. So chat to your floral designer and let them know what styles you are loving on for your reception blooms, but also what type of food service you are choosing, so we can advise on the best styles for you to move forward with, while keeping your aesthetic perfectly in line with your entire wedding style.